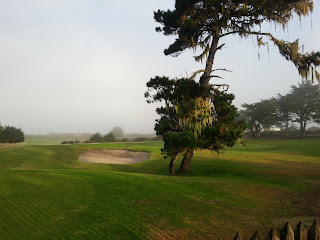 This morning I got up dark and early and prepared to head out to Livermore for the race I have decided is a consolation prize for those who didn't get in to Nike, since they are on the same day. But boy, does this race have some perks compared to Nike. For starters, there was no traffic anywhere, and I rolled right into the nearby parking lot, minutes from the start and finish line. No tricky logistics to take care of there. I started having some foot pain during my run on Thursday, presumably part of the never-ending big toe/first metatarsal dysfunction. During Saturday's 10k, the pain was pretty intense after mile 5. My foot felt fine after I loosened my shoe completely up and the rest of the day, but I still worried about running 13 miles on it. And indeed, when I put my shoe on this morning, my foot already hurt. I tried an older pair of shoes and loosening the laces, but it didn't help. I contemplated not driving to the race but figured I would go pick up my tech tee at least. I drove sans shoe, so my foot felt fine, and I walked over to packet pickup with it partially laced to avoid pressure. I was thrilled to discover there was a sports chiropractor already set up before the race, and he graciously offered to take a look at my foot. He did some quick adjustments and got everything moving much better. I also relaced my shoe to skip part, and then I could run without pain! I picked up my packet and went back to my car to drop the goodies off and get ready to race. Super easy! On the race logistics, there was a bit wanting. There could have been a few more port a potties, but the line moved quickly. The gate we were supposed to run through was locked, but they got it opened only about 10 minutes after supposed start time. 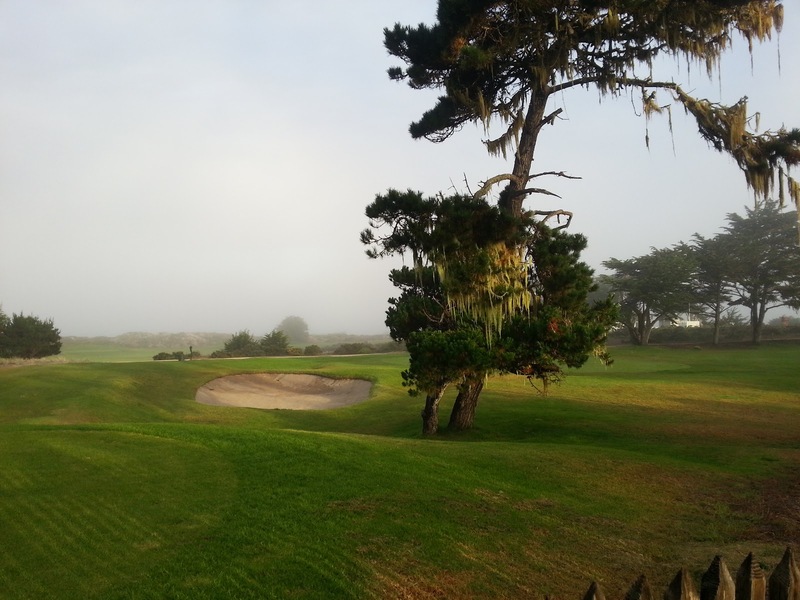 There were also two cars parked on the course right at the start because it was so poorly marked and they had to make announcements for the owners to move them. Eventually we started. I only noticed because the people in front of me started moving - no one bothered to do a count down. Once the race started, it was beautiful! We started on a bike path out to some vineyards with rolling hills. After a 7 mile loop we were back near the start/finish and heading out on an out and back on another multi use path bordering a stream that was full of water! I had no idea such things existed. There were fall colors in the vines and the trees. Luckily they changed the course to do the exposed part first and the shady part last as the temperatures were soaring into the 80s today. There were hardly any spectators, but there were several friendly ones as well as some people out for walks who were kind enough to cheer for me. One lady I saw several times told me at mile 8 that I was almost there. I said I didn't know about that. I saw her again at mile 9.5 and she said, Now you're really almost there. What can you do? The race could have been marked better. In a couple locations the path splits with no signage, and there wasn't always someone immediately in front of me. Basically you had to just stay on the main path, and it did work out in the end, but an extra arrow or chalk marking would be well regarded. I had a great run. I felt good from the beginning, and my foot behaved itself for the most part. There were a few instances in the early miles where I could feel it, and I discovered that it hurt a lot on the sharp corners and uneven surfaces, so I spent the rest of the race trying to land perfect footfalls. That seemed to do the trick - it never became more than a discomfort except for a couple of twinges. I decided that I was feeling so good, I might as well go for the PR, because if my foot is messed up, I have little hope for a good marathon given that I am right in the middle of peak mileage training that may or may not happen. So why not have one good race? My garmin is not working now, so I am relying on my phone to map distances. Since it lives in my pocket and not on my wrist, I don't look at it as much. I looked it it about once a mile for the first several miles and was presently surprised to see I was running 8:15. I never looked at it after mile 9.5. I felt this was a good strategy for the next couple of miles, but after the 11 mile marker when I wanted to start picking it up and it was getting harder, I really could have used a sneak peek at my pace. When it feels that hard, I have trouble judging if it is hard because I am going so fast or just because I was tired. Turns out it was the latter. My last two miles were 8:19 and 8:26, significantly slower than all the other miles except the first. If I had seen that in real time, I think my rain could have convinced my body to go faster. I don't think it helped that the field had thinned out,I had passed people, and no one was passing me. I didn't really have any good indicators. Regardless, it turned out to be a PR by nearly 2.5 minutes. At 1:49:41 it is sub-1:50, which I am pretty excited about. After the race, my foot did not feel too pleasant, so I stopped back by the chiro and got another adjustment that enabled me to walk back to my car without pain. I already booked an appt with my chiro tomorrow and hope to get this sorted out soon. All in all, I enjoyed the race. 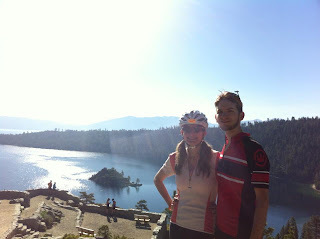 The scenery was beautiful, the weather was great, and the parking was superb. No Tiffany necklace, but I am over $100 richer for my race choice. After some extremely busy weeks at work, watching everyone else go on summer vacations, I became obsessed with the idea of needing a vacation myself. 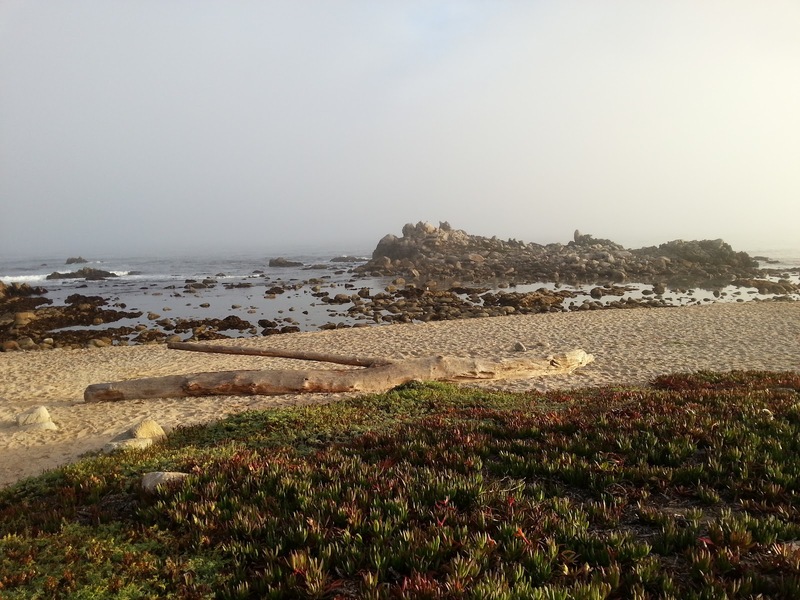 A few days before Labor Day weekend, I realized that a 3 day weekend could at least partially fill that need, so Matt and I booked a last minute hotel in Monterey. We drove down Saturday morning, along with the rest of the Bay Area apparently. 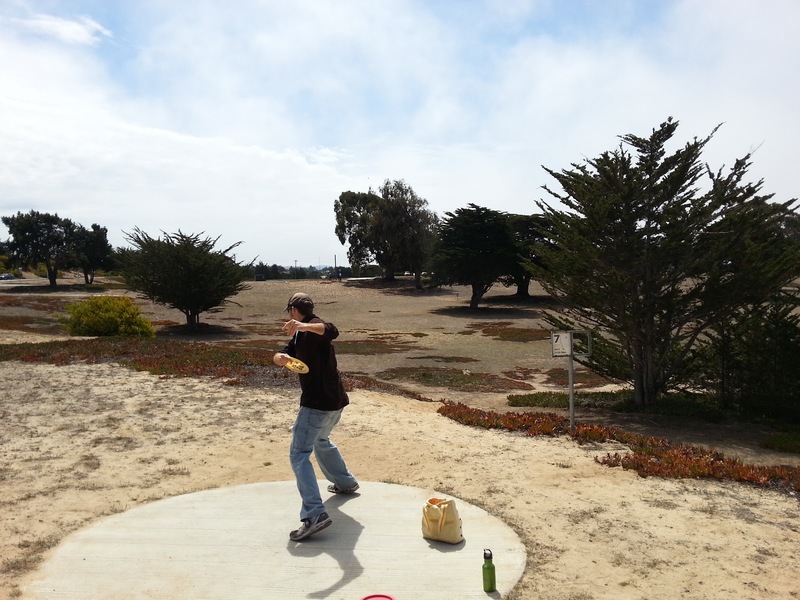 First stop - CSU Monterey Bay for some disc golf. 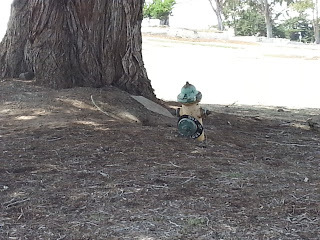 What a weird place - the campus appears to be built on old military grounds, and contains vast open spaces with random deteriorating foundations and pavement (and fire hydrants under trees in the middle of empty fields). There are millions of parking spaces, but all require campus parking permits. All of the buildings appeared to be dorms, and I have yet to figure out where they attend classes, but I'm sure they must have to drive. 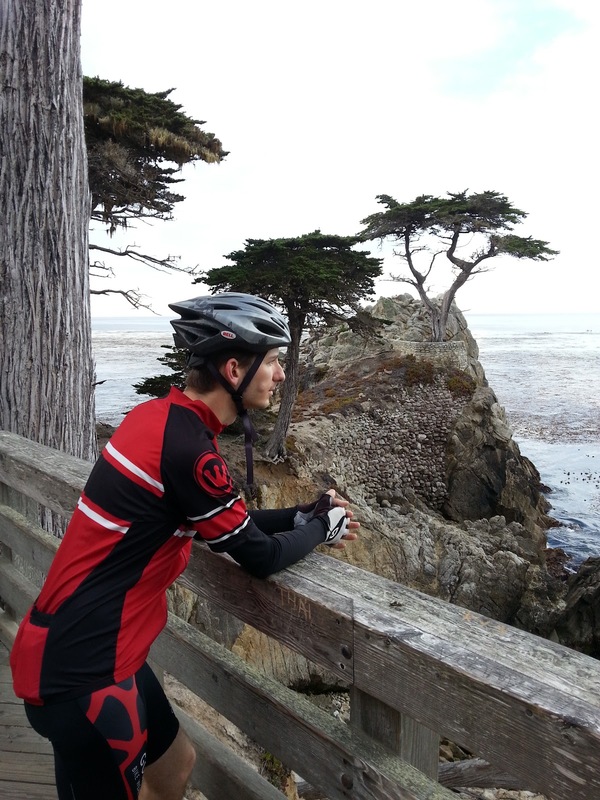 The next explicitly Monterey experience was heading out to dinner to get Matt some pasta for his pre-ride meal, only to be told that there were no tables available that night. We had arrived before 6pm, and at least half the tables in the restaurant were empty. We went across the street and had some less than mediocre food. Matt for some reason claimed he would still rate them 4 stars. We then wandered down to the coastal access point at the Aquarium, and saw several cute sea otters through the scope, as well as a lovely sunset. Sea otters are my favorite. The next morning we got up early - me to run 9 miles and Matt to ride 70 miles. 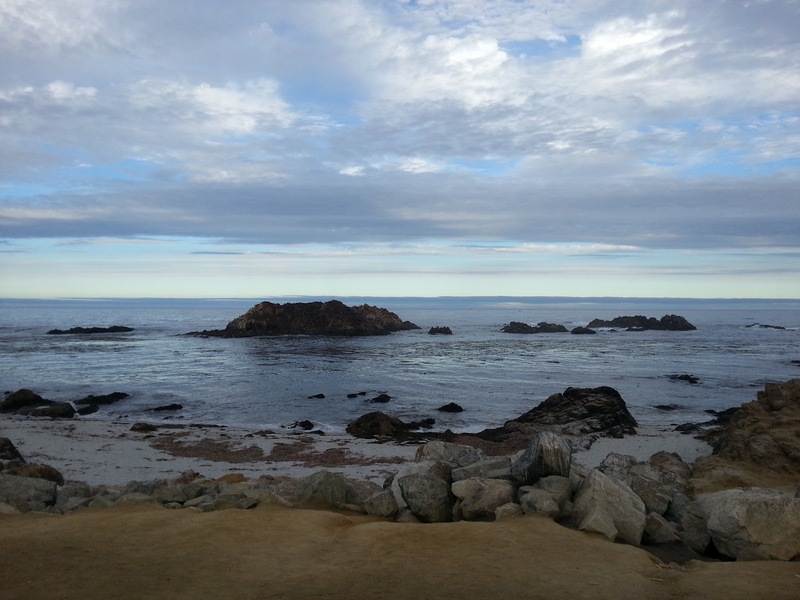 My run took a little longer than usual given that I stopped every 50 feet to look at the all the seals and take pictures of gorgeous views. I decided to not worry about meeting my pace and just enjoy the run, and it turned out my pace (not including picture stops) was actually just a few seconds off from goal. 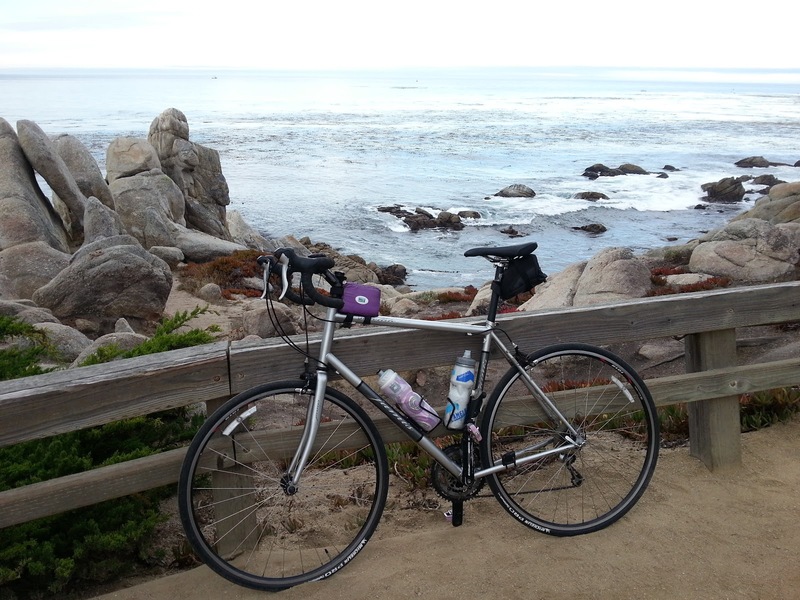 I covered the Coast from Lover's Point to the end of the boardwalk inside the 17 Mile Drive. 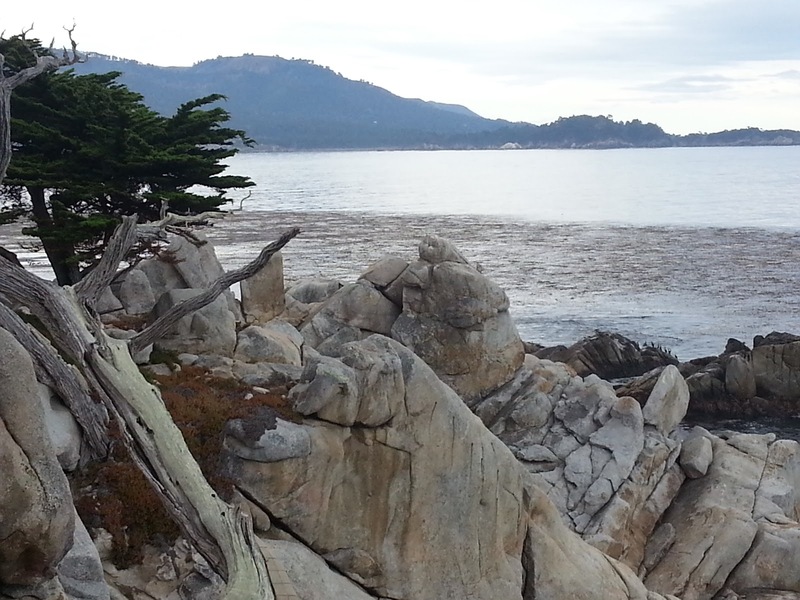 After my run, while waiting for Matt, I walked back down to Point Pinos and explored some tidepools. I didn't find too much exciting except for some crab wars. I had settled in to watch a crab about the size of my hand try to pry something open, while dozens of hermit crabs in snail shoes followed it around. 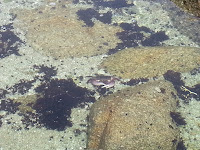 Eventually another larger crab sidled over and made a quick play for the first crab's prize. 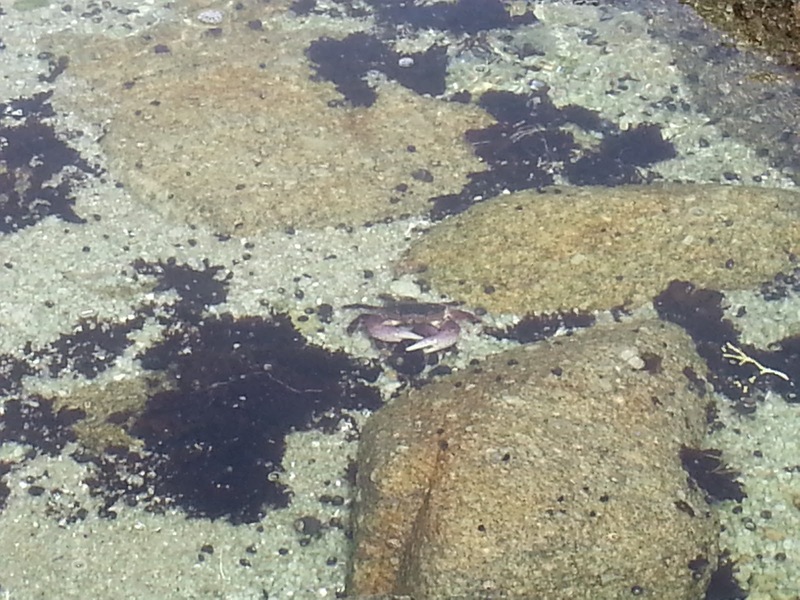 After some claw snapping and scurrying around, the second crab sidled back off. I was fairly certain that the thing the crab was trying to pry open was in fact another crab, but the internet does not seem to indicate that this is something they do. 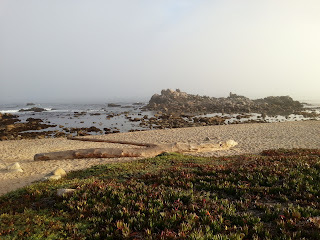 After tidepooling, I headed into downtown Pacific Grove for a lovely lunch outdoors at a bakery, and then wandered back to my hotel via the long route on the Coast. I had run in the same location that morning, but enjoyed it even more. 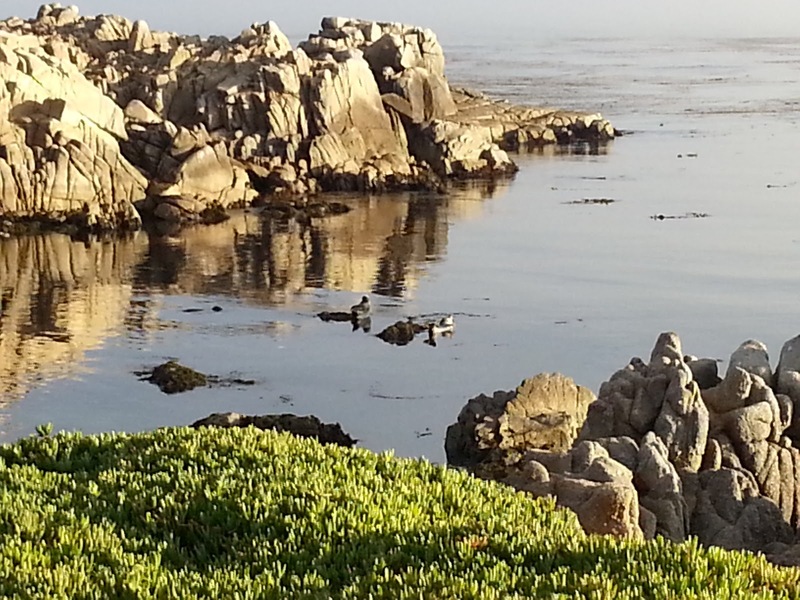 Just past Lover's Point, there were several seals hanging out on rocks, mostly just one or two per small rock. As I was walking past one, I saw a seal head emerge from the water and appear to take a nip at the tail of a seal that was on the rock. The seal immediately swung around and started growling at the interloper. It maintained its place on the rock. The losing seal swam away, slapping its fin on the water every so often, which apparently is a sign of aggression. By this point I had settled in by the side of the trail to watch the seal wars. I was soon rewarded as another seal made a successful attempt on the same rock. For awhile they shared the rock, but eventually the original seal was forced off. 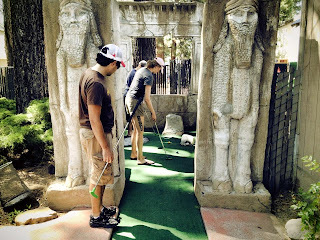 Another rock was in contention also. Apparently in that location, there just weren't enough rocks to go around. 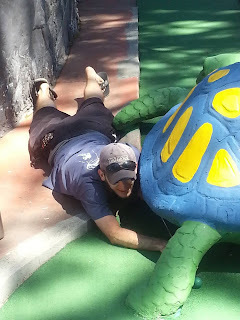 After Matt came back from his ride, we headed down to the Aquarium. We had been able to purchase tickets from our hotel, thus skipping the line and walking straight in. It was a nightmare. Screaming children everywhere. There is a chance that 3pm is nap time. 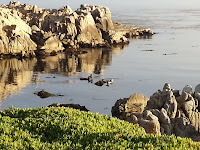 We first hit up the sea otter feeding, which was pretty great, except for several adults who had places at the glass and refused to let any small children in front of them to see. We then pushed through masses of humanity to see puffins, seahorses, and some weird disco-themed jellyfish exhibit. I think my favorite was the Octopus, which delighted us by crawling all over the window of its tank. The octopus as the Cal Academy was always holed up in a corner. Poor things. Also, I just learned that sea otters sometimes actual eat giant octopus. Yikes. 1.5 hours and we were done. I remember loving the Aquarium the first time we went, largely because of the emphasis on conservation. I felt that message was lacking this time, especially because we couldn't find a recycle bin anywhere on the premises. However, perhaps it was just too crowded for me to read the messaging. After the Aquarium, we headed to a non-pretentious pizza place with red and white checked table clothes that let us in without thinking twice. Still cost an arm and a leg though. The next morning I think was the highlight of the trip, for me at least. 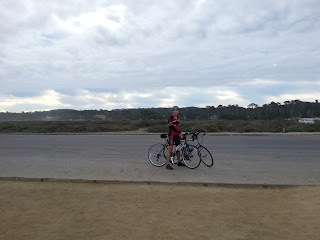 We again woke up early and hit the stretch of the 17 mile drive along the coast, skipping the fee by taking our bikes. The roads were empty and the sky a gorgeous morning overcast blue. We saw a large rock so covered with brown seals that we didn't notice them at first except for the sounds. 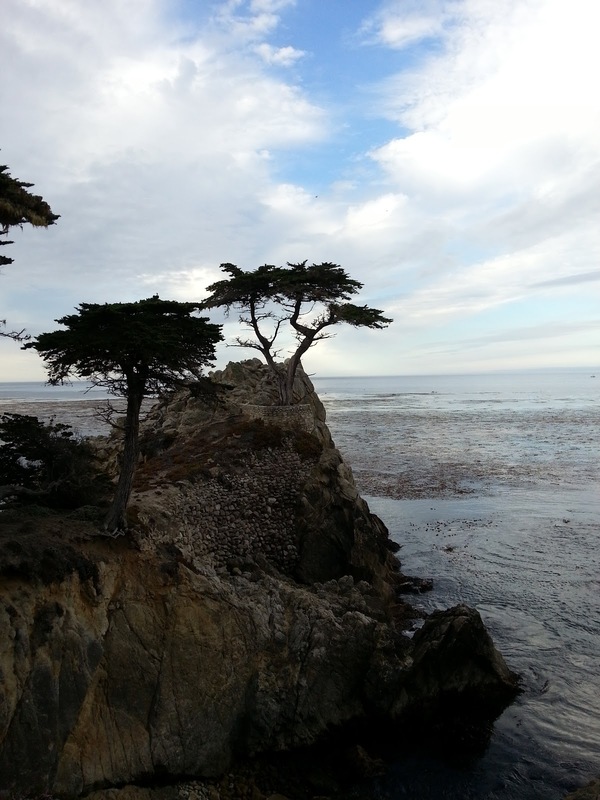 We rode past cypress trees and rocky outcrops. 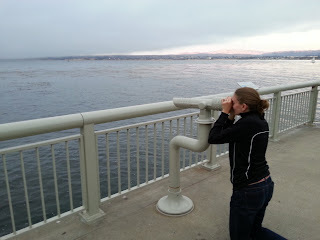 We stopped for awhile to look for otters in the kelp forest, only to be rewarded with the sight of 3 dolphins. I happened to see a fin pop up out of the corner of my eye as I was turning away, and sure enough some dolphin heads and tails followed as they arced through the water in front of us. Beautiful! We did see some otters also, but they were pretty far away. On the return trip we were sprinkled on a bit, but it was so beautiful even I didn't mind. 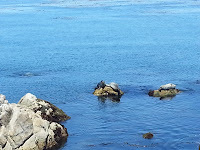 For our final vacation outing, we headed up to Elkhorn Slough to go kayaking with the sea otters. I have to say, I was slightly disappointed by this experience. I'm sure Matt would tell you it was because of my constant complaints about how uncomfortable the sea kayak was (I prefer sit-on-tops), but I also felt like the (non-animal) scenery was depressing, and I felt rather uncomfortable about how many kayaks were out on the water and how close we were to the animals. We were told to stay 100 feet away from the animals, but it is often impossible when there are seals and otters popping up all around you. However, that part was pretty awesome. We saw otters, much more close up than any others that weekend, cleaning themselves, eating, and one even carrying a baby around on its stomach (we think at least). 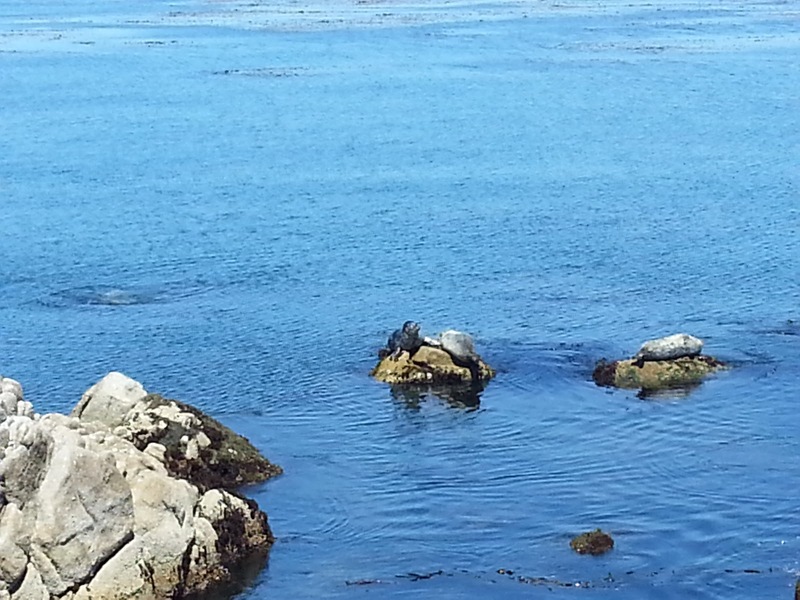 I found the seals rather frightening, as they would pop their heads up, stare at us for awhile, and slink away. I always felt they were lurking. 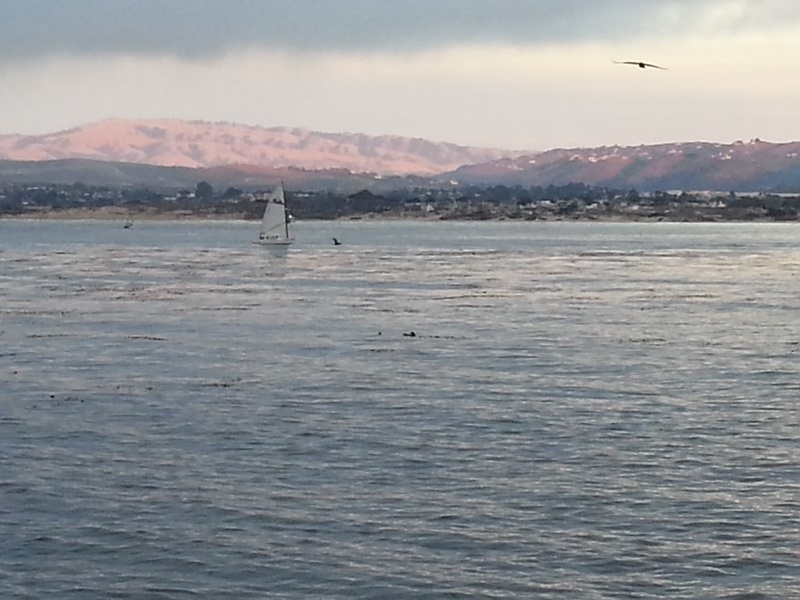 We also saw lots of pelicans fishing and flying low overhead which was also amazing. Luckily my elbow was functional, because we may not have made it back to the dock against the current if only Matt had been paddling. The other crazy part of this trip was the jellyfish - they were giant! After I saw the first one awfully close to the kayak, I made sure to keep my elbows far away from the water at all times. They were pretty neat to look at, but also terrifying - and I don't even know if they are harmful ones. But the last thing I wanted was one in my spray skirt. To wrap up the trip, we had an amazingly smooth trip back home, where I promptly showered and climbed into bed for the rest of the evening. Vacations are hard work. 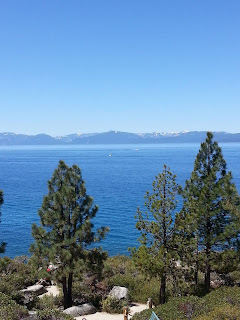 We have lived in the Bay Area for going on 5 years now, and we have only been to Lake Tahoe a couple of times - once in summer when Matt got sick and we had to go home, and once in the winter. That's all I remember at least. 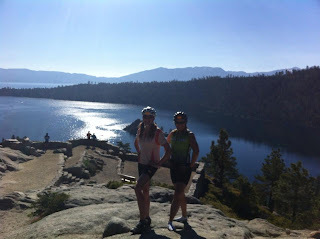 We've been to the Truckee area a few times also but not to the Lake on those visits. I am pretty sure we are crazy. 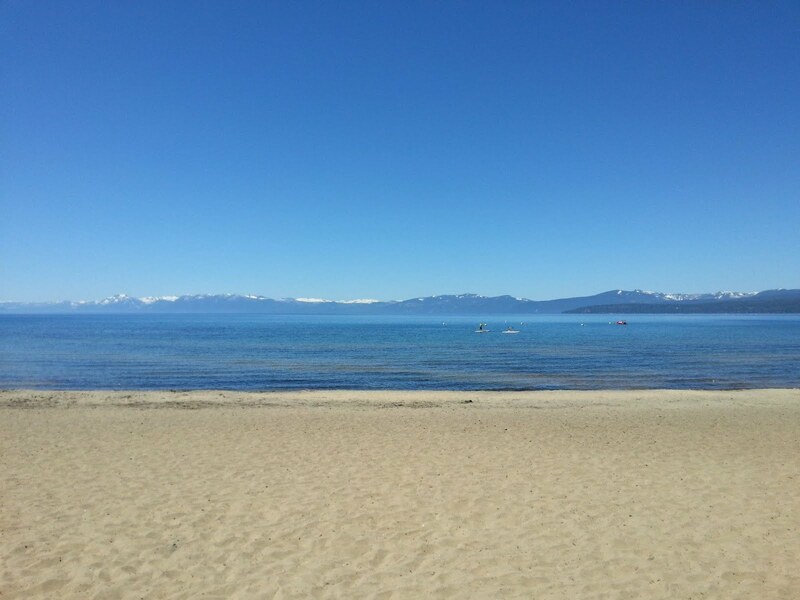 Lake Tahoe is awesome. Saturday: a little relaxation time at the beach. 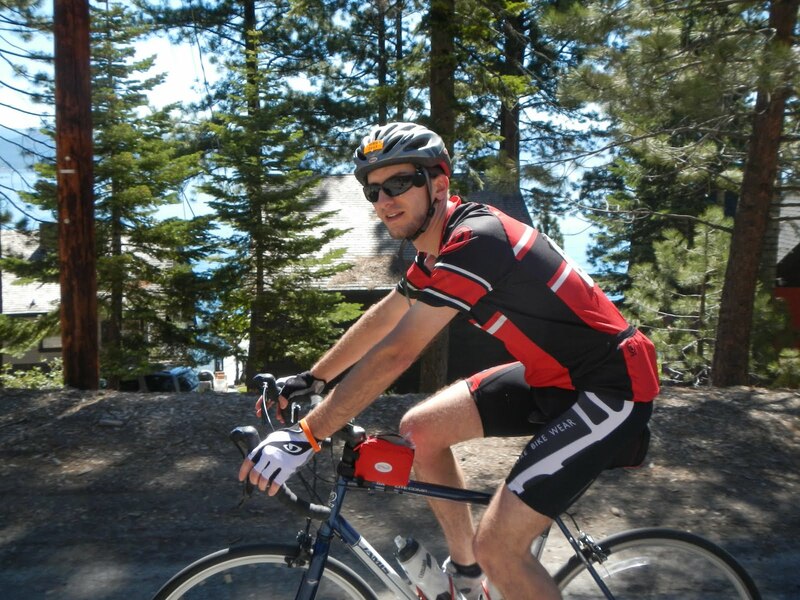 Sunday: A 72 mile ride around the lake, AMBBR 2013. The first 40 miles were amazing! The last 30 a little less so, due to my poor preparation and some possible altitude issues. But still amazing. Still fresh at mile 13, overlooking Emerald Bay. 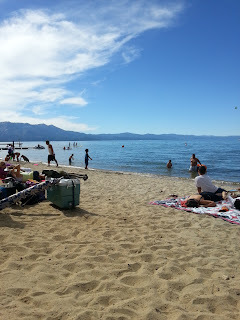 Sunday: Some more beach time at Zephyr Cove, including track ball and frisbee. And finally, mini-golf! Nearly everyone we know who rides a bike was there. We shared a house with three friends, saw numerous others out on the course, had some drinks and laughs with others after the event, and even somehow missed seeing some people entirely. The weather was perfectly sunny and about 80 degrees. It turns out property is actually strangely affordable, so research will begin on our vacation home... 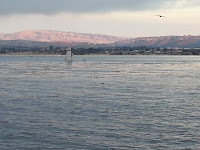 Since we can't afford a house in the Bay Area, maybe we can claim it is our primary residence? Thanks to everyone who helped make our weekend enjoyable, and especially to those who planned it for us. You rock! 15 minutes of cleaning (or tidying) every day. I think I saw this recommended on Crazy Aunt Purl before, but I've never implemented it. I hate cleaning, mostly because it always takes so long. I am going to try to make a commitment to do just a little bit every day. I am going to try to figure out an accountability path for this - I don't want to bore you with blog posts or facebook posts about my super exciting cleaning, but maybe I can record it in a sidebar of sorts. If you are interested in completing any of these challenges with me, or in trying to hold me accountable (i.e. posting on my wall about whether I've done a core workout this week or what have I cleaned today), your participation would be most welcome! I love to have partners in crime. Since my first season of TNT, I have been mostly a failure in the stick to a schedule department, so I'm hoping to get back into the groove here. Do you have any challenges I should know about? Or any methods of accountability? UPDATE: Check out my sidebar for a Joe's Goals tracking score. I'm aiming for 1-3 points per day and an average of 2 points per day in any given week. (7 points a week for cleaning, 5 for working on Coursera, and 2 for strength training.) Please yell at me if I'm not achieving these goals. 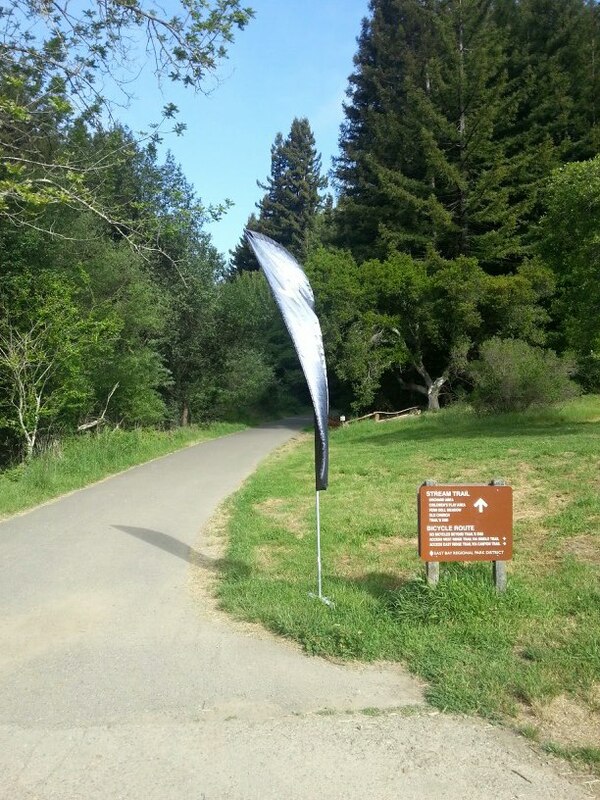 Several months ago, Matt learned from one of his co-workers about a new racing company, Sasquatch Racing, who would be putting on a trail half marathon in Redwood Regional Park near our house. It was in April, about a month after the marathon, and it seemed like a good opportunity to take part in my second ever trail half marathon in a convenient location. Plus, the event advertised a 9:30 am start, medals that functioned as bottle openers, and beer at the end that wasn't Coors Light (and would be drunk after noon because of the late start). After a short pep talk about following the red ribbons and who knows what else, Marathon Matt, one of the founders, walked us a few feet forward toward the line and suddenly started counting down. From 3. Okay, I guess we're starting! I have run many of these trails before, with my typical route being a 7.5 mile loop on West Ridge and Stream trail. During the race, I got to experience several other trails. My very favorite was a hair-pin near-loop off West Ridge made up of Baccharis, Dunn, and Graham. The trails wound through several small canyons full of Redwoods. 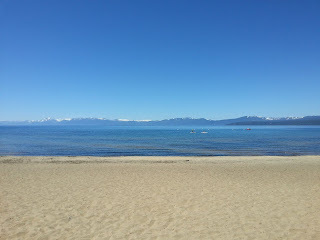 It was absolutely gorgeous! I will definitely be heading back to those trails on future visits to the park. The first couple miles are pretty much straight up hill, and having suffered from a head and chest cold for over a week, they weren't super easy. But I have no shame in walking up hills anymore. After that it starts to get more uphill rollery rather than straight uphill, and around mile 7 there was a nice downhill on Stream. 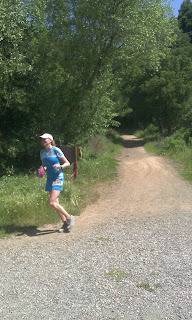 Many parts of the upper trails were sun-baked and felt like running on concrete, which wasn't fabulous. Then another short uphill on Prince, where at the top, I was demoralized by seeing runners heading the other way, 3 miles ahead of me. I continued run-walking, walking up most of the hills no matter how steep. 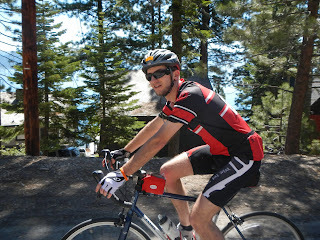 I had started coughing fairly often by this point, which would continue throughout the rest of the race. (It is physically difficult to run while coughing, by the way.) Finally on my way back down, I was walking up another hill but had pretty much crested it and should have been running again. A friendly hiker cheered for me by bib number. When I looked up I realized it was the TNT hike coach. I promptly started running again and thanked her for the inspiration - I was embarrassed to have been caught walking. After finishing, I promptly had an extraordinary coughing fit. Poor Matt had to dig out my inhaler as fast as possible, but it didn't help much, probably given that it was likely sickness related and not asthma related. He informed me later that people were looking at me, so I guess I embarrassed him. Alas. Eventually I was able to calm my lungs down and feel like a normal person again. 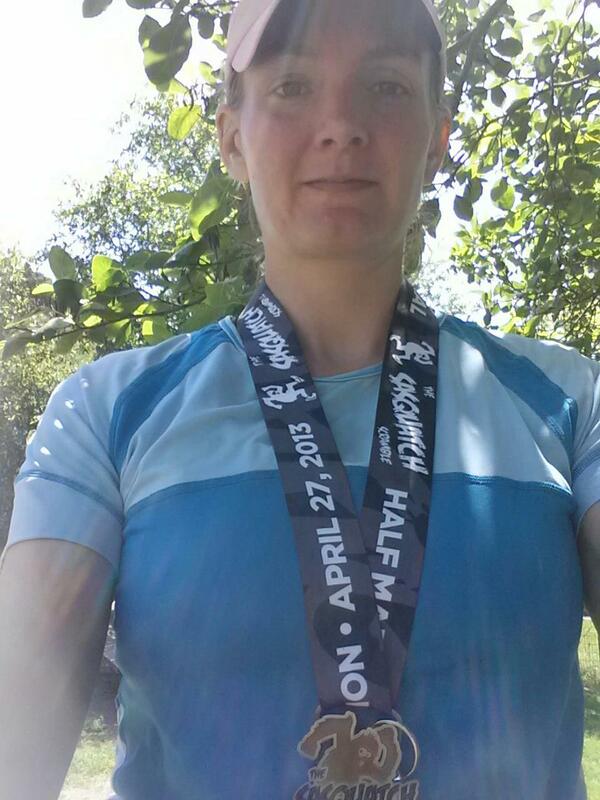 The race would have been much better had I not been sick, but I still enjoyed it. 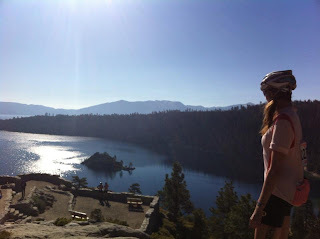 Running on trails makes me count the miles less; I simply enjoy the scenery. It was great to find the awesome new (to me) trails. At the end I was handed a giant sugar cookie with a picture of Sassy, as well as a medal that does NOT double as a bottle opener, but with a bottle opener attached. Bummer. Maybe next time. 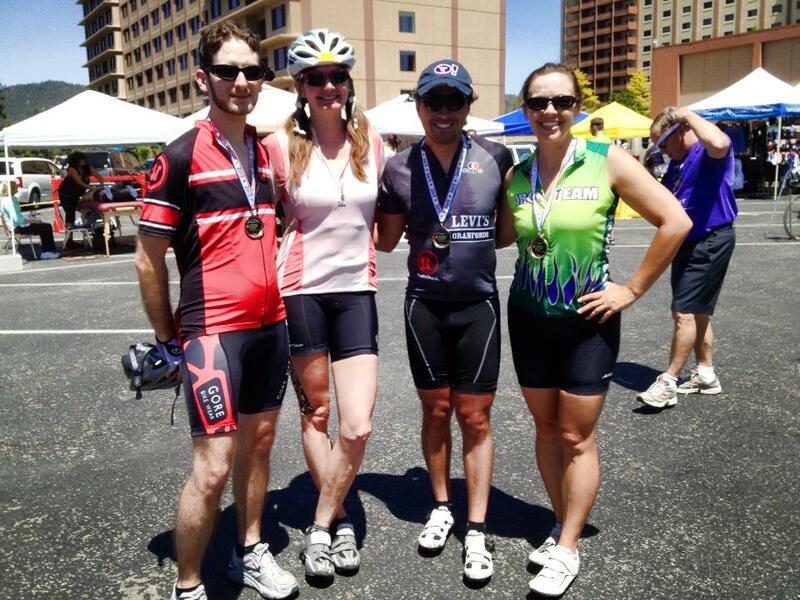 All-in-all, it was a good race for an inaugural race. I would have liked more food at the end besides the cookie, like salty snacks. The Red Hook Beer was tasty though. They did have a signage error on the last turn, marking it with solid flags instead of swirly flags, but hopefully no one missed it. I was also confused about the aid stations because they had changed their approach since the initial course description, but that maybe was my fault. I would do one again, if priced right, especially the awesomely-named Honey Badger Half for which I still await details. However, while I do enjoy trail racing, I think that I will not forgo road racing completely. Because every trail run is different, with different elevation gain and levels of technicality, it is hard to judge your performance in comparison to other races. For instance, according to Strava, this race had 200 feet less elevation gain than the one in December. I finished 10 minutes faster. 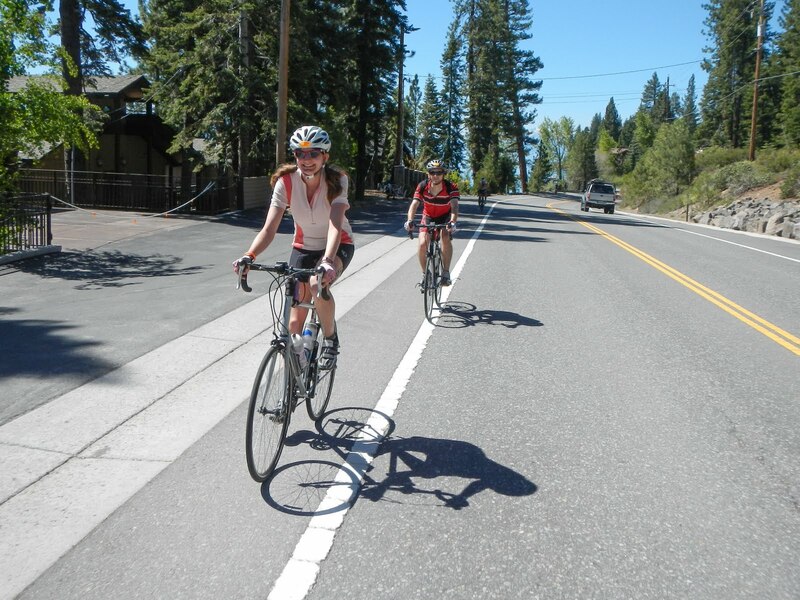 Is this all due to elevation gain? Who knows. 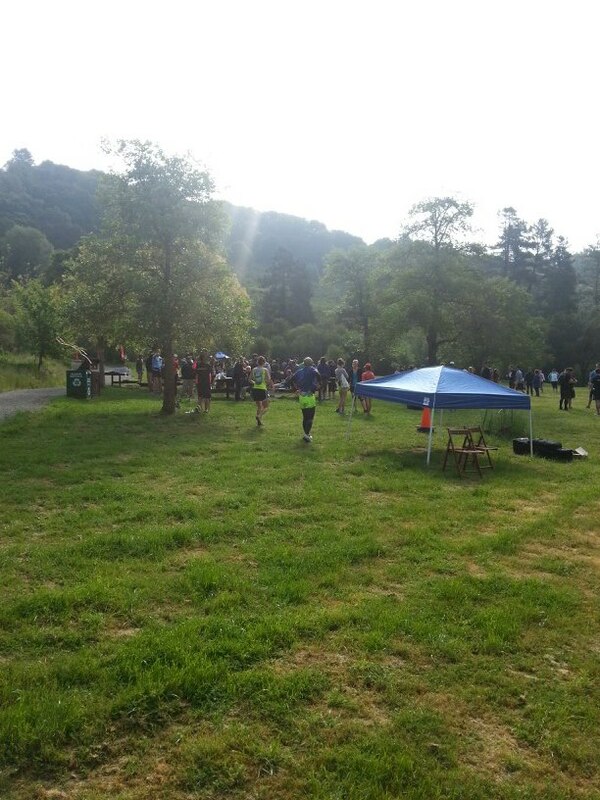 In addition, although I like low-key racing, I also like at least some of my races to have more excitement, like the Xterra race, and the Brazen races I did Thanksgiving weekend. I'll just keep mixing it up. I also totally forgot to mention, since I was sitting down while writing this, that my calves have absolutely seized up and I can barely walk let alone go downstairs. I remember after Xterra being shocked about how not sore I was given the elevation gain. Not sure what in the world happened this time. Sometimes when I am bored, I look at the Trulia app on my iPad. I have it set to single family homes less than $500,000. Usually this doesn't kill too much of my boredom because there isn't much to look at. This last time I found a beautiful house in the hills for $400,000. This is amazingly cheap for the Bay Area, and it also contains a potentially rentable lower level. Matt and I became somewhat serious about potentially investigating and purchasing this house. In the end it appears to be seriously underpriced just to start a bidding war. But it has gotten me thinking. I love the idea of renting because you are not tied down. Awesome job in another location? No problem. What if one of us loses a job? Just downgrade. What if we decide to spend a few years in another country? What if my wayward spouse decides to go back to school? But here in the Bay Area, that is an enormous and scary monetary commitment. And it makes, by default, so many decisions about our future. Will we ever be old enough to make these adult decisions? Last Monday, I spent my first hour in the office watching the women's finish of the Boston Marathon. A few hours later, I took a brief glance at facebook only to find numerous posts linking to the explosions at the finish line. I was glued to my computer, trying to learn about what had happened, shakened by the random violence on the marathon spectators. Though I didn't know anyone running the race this year, I know many people who's dream it is to get there. And I can't imagine the guilt a runner would feel when their family and friends, who had come to watch them finish, ended up in the hospital instead, or worse. It was shocking; how could this happen to one of America's great institutions. That same week, 14 people died in a fertilizer plant explosion, 7 died in election protest violence in Venezuela, 2 Richmond teenagers were shot in front of their homes. Probably some ungodly number of people died in countries where war and terrorism are a common occurrence. At the Boston Marathon, while more than a hundred people were wounded, many severely, very few died. So many fewer than in Newtown, Aurora, Tucson. And yet, our lovely Congress failed to enact meaningful gun-related legislation that same week. Because a background check? God forbid. I remained glued to the news throughout the release of the photos, the search for the bombers, the killing of the MIT policeman, the grenade launching, the manhunt in Watertown, the blood on the boat. To find one teenager. I am complicit. We are all complicit. We live in a world where traditional terrorism freaks us out enough to shut down an entire city for an entire day, while more frequent mass shootings appall us, but not enough to do anything about it. Where we fight regulations, the kind that might keep a fertilizer plant from exploding and flattening a town. We are confused. Last Thursday, I participated in a run for Boston and a candlelight vigil. It was lovely; it was a celebration of running and unity. While I will continue to run marathons, I certainly can't ask anyone to spectate. That's why terrorism is insidious, making us second guess our actions. But are random mass shootings and giant explosions really all that different? I've done it! I CAN do this! I WILL do this!